Your reputation is your most valuable asset. Your clients rely on you to guide them through a complicated and sometimes stressful process. Demonstrate to them that their trust in you is justified by referring them to us. Our training and professionalism will deliver the information your clients need. We can help you market ALL of your listing by creating the listing, capturing leads, driving those leads to the listing, and driving those leads to the listing agent website. If it's your listing then it's your lead! Having your clients home inspected before listing it for sale is a great way to eliminate stress for both you and your client, along with saving your clients money and time! InterNACHI is so sure of its inspectors that it will indemnify any licensed real estate agent in the amount of $10,000 if a third party successfully sues the agent for negligent referral of an InterNACHI inspector. 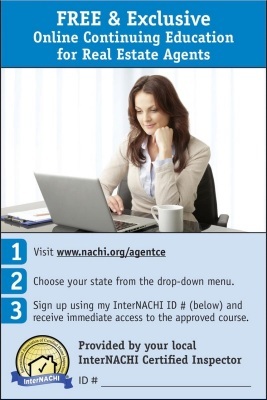 This protection is offered at no cost to agents who register. 3 FREE online continuing education classes that count for 9 hours of CE! Get ahold of us to sign up then Click Above! 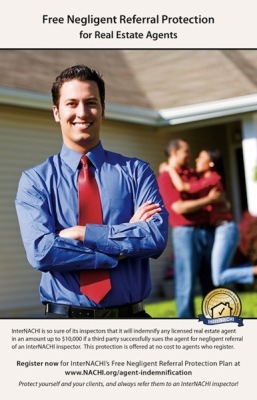 With the Buy Back Guarantee, your clients have the peace of mind knowing that if something comes up, they're covered!